Growing just 5-6' tall with an elegant, weeping habit, this redbud is perfect for small gardens, lawns, woodland gardens or naturalized areas. Attractive red-purple flowers bloom profusely in early spring. 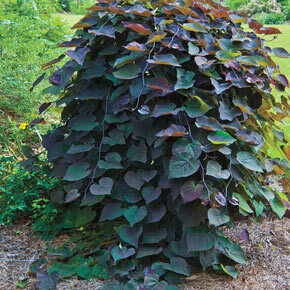 Large, heart-shaped leaves add interest through the seasons. Has low pod set. 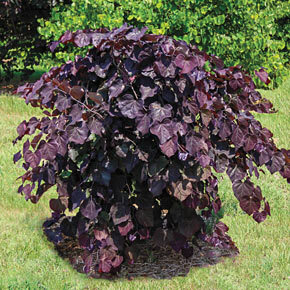 Cercis canadensis 'Ruby Falls' PP #22,097. 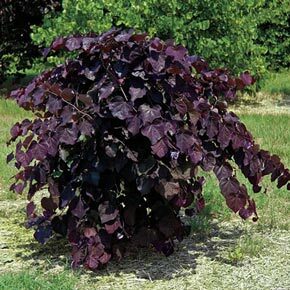 Flower Form: intermediate reddish-purple flowers borne on bare stems in early spring. Profuse flowering and low pod set. Pruning: Minimal pruning is needed Late winter or early spring. 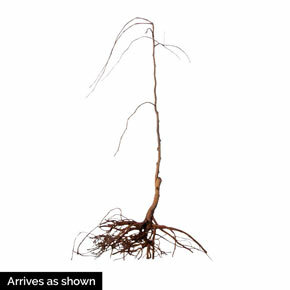 Additional Information: You can train this tree to grow taller by attaching the leader (uppermost limb) to a stake when it is young and pliable.